BOLOGNA — Teatro Comunale’s busy direttore musicale Michele Mariotti, 38, ventured his 33rd and 34th operas* this month with a foray in verismo, the terse tribulations of Cavalleria rusticana, and, incongruously, La voix humaine, a vehicle for the Bologna-schooled soprano, former mezzo, Anna Caterina Antonacci. He chose big voices in Mascagni’s melodramma in un atto (1889) — Carmen Topciu a smooth-toned Santuzza at the April 9 opening, Marco Berti a steely Turiddu, Gezim Myshketa an engaging, richly projected Alfio — and took a broad, detailed view of the score, tracing its melodies grandly and milking its dark sonorities. His orchestra provided luxuriant support, but it was the ardent and incisive singing of Andrea Faidutti’s Coro del Teatro Comunale di Bologna that left the firmest musical impression. Antonacci communicated handsomely through the notes as Elle in Poulenc’s tragédie lyrique en un acte (1958), before the break, without always correctly projecting Cocteau’s vowels. Mariotti proved a restrained collaborator here. None of the musicians were helped by Sicilian stage director Emma Dante, whose unspectacular concepts limited both operas. 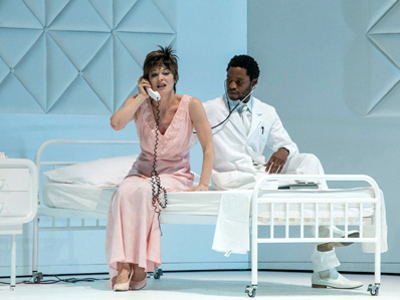 The Poulenc she placed in a nuthouse, with Elle on an unconnected receiver, thus forcing the elegant Antonacci to enliven not Cocteau’s suspenseful telephone call but what amounted to a 40-minute tantrum. Six mimes, two of them nurses with needles, buoyed the effort. The Mascagni she set against a black background, relying on corny props and costumes to summon vital notions of Sicily while she made points about men’s abuse of women. Crucifixes (a trademark of hers) and sad-sacred imagery suggested her confusion of Easter Day with Good Friday. This entry was posted on Tuesday, April 25th, 2017 at 2:36 am	and is filed under Munich Times. You can follow any responses to this entry through the RSS 2.0 feed. Both comments and pings are currently closed.